I have heard so many good things about Magformers. They are great for children (and adults) of all ages (3+) and are great for imagination. I've been wanting to get some for a while. So I was happy when they emailed me about a review. 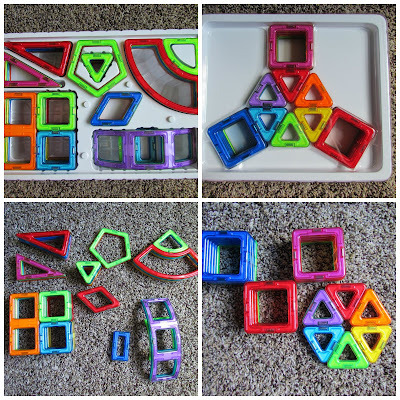 Magformers are little blocks of different shapes and they have magnets inside so they stick together. But they stick REALLY well!! I asked for the 55pc dinosaur set and the 62pc, they sent a 30pc, but later sent me the 62 as well! Ball made from the 30pc set and a T-Rex!! 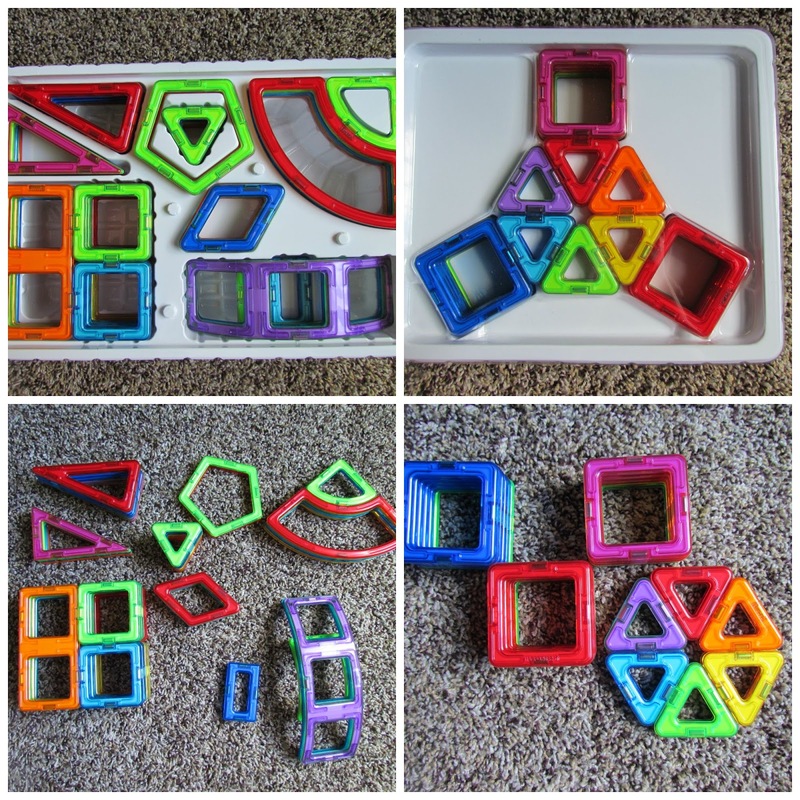 My kids have been loving their Magformers SO much! In fact, it's the only 'toy' we brought to Disney with us. All 3 of my kids love them equally and they all enjoy playing together with them. They are 8.5, almost 4 and almost 2. Since the magnets are on all sides of the piece, they stick together real well. And even though ALL the sets include an idea booklet, it is super easy to construct your own design with these. They all stick together well and the magnets are strong. Plus when you shake the pieces they rattle, so my littlest likes to do that! Magformers keep them quiet for a LONG time and that's priceless. I will be buying my kids another set or 2 for Christmas. I like that they're not real small pieces, so they don't get lost easily which is great for me! They won a Best Toy for Kids in 2009! And I wholeheartedly agree! These are things that will last YEARS in your house. They don't get old and it won't be garbage in 6 months. I promise! So it IS worth the investment to have a good long lasting toy! Overall: ***** hands down!! AMAZING toy and the perfect Christmas Gift! ONE winner gets their CHOICE of what I received!!!! So the Dinosaur, 62pc or 30pc set! The Dinosaur Set is my favorite! We love these! I think the dinosaur set is awesome! The dinosaur set is really cool! I love the super brain set! I'd love the dino set, thank you! I love both sets!!! The dinosaur set is cool, but I might have to go with the 30 piece set! My son would love the Dinosaur Set! I also love the Magnets in Motion 37 Piece Gear Set!! These are so cool! maybe the dino one best? My son would love the dinosaur Set! We love the carnival set!! Super fun! My son would love the Dino set! The dinosaur set is my favorite. I like the dinosaur set best, but the Magformers Smart Set 144 Pieces looks awesome, too! I think my daughter would like the 62 piece set the most. My son would love this! What an awesome set! I like the Deep Sea set! I like the Magformers Smart Set, 144 pieces. The Super Brain Set looks cool! I love the Dinosaur set! Anything Dino is popular in our house right now! I don't know if I could pick a favorite, they both look like so much fun! But, I know that my son likes the 30 piece set because we've played with it at a friend's house before. I think my favorite is the 62 pc. set because there's more things that can be made from it. I love that they're magnetic. Thank-you!! The dinosaur set looks amazing! I never would have thought you could make a dinosaur with these! My favorite is the 62 piece set! These Magformers look like a great toy to spark children's imagination! I love the Lighted Set! The 62pc, Where you made the wheel with!! Thank you so much for the chance! I like the 62-pc. set! The Dinosaur Set is my favorite. I appreciate that the pieces aren't SO dinosaur-specific that they couldn't be used to build other things as well. My son would love the dinosaur set.